1. Preheat oven to 200ºC, gas mark 6. Place asparagus, potatoes and onion in a roasting tin and spray with oil. Roast for 10 minutes. 2. Meanwhile, mix the cottage cheese, eggs, Parmigiano Reggiano and 1 tbsp of thyme in a bowl, season and set aside. Grease a 30cm x 25cm baking tray and lay the filo pastry onto the tray. 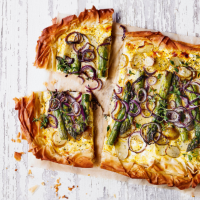 Pour the cottage cheese mixture evenly into the bottom, then layer the asparagus, potato and red onion on top gently pressing them into the filling. Roll any excess filo inward to form a crust. Brush edges with oil. 3. Bake for 20 minutes until golden, remove and stand for 5 minutes. Garnish with remaining thyme and serve.